You might have noticed that we’ve published a new book – a companion for the TV series – and you might be wondering what it’s all about. You can read some of the reviews here if you’re interested, and below you’ll find answers to your FAQs. 1/ Who wrote the book? The book is written by John Bailey and illustrated by Rob Olsen who also wrote and illustrated the comic strips. 2/ Will the book tell me anything about Bernard Venables & Mr. Crabtree? Yes it will. The foreword is written by Hannah Bruford (Bernard’s Daughter) and Section 1 is called ‘Mr. Crabtree – An Introduction’. You’ll find previously unseen pictures from Bernard’s private family collection, and the entire book is peppered with references to the classic ‘Mr. Crabtree Goes Fishing’. 3/ How is the rest of the book laid out? 4/ Is it the same as Mr. Crabtree Goes Fishing? Goodness me, no, not at all. John & Rob are huge Crabtree fans and this book, whilst reverential to Bernard Venables and the Crabtree legacy, is in no way is it a facsimile of the original. Fishing in the Footsteps of Mr. Crabtree enables the authors to take the lessons they learned from Mr. Crabtree and apply them to the world of modern fishing, bringing those teachings bang up to date. So for anyone looking for a companion book as they begin their foray into fishing, this is it. It’s also the ideal book for the experienced angler wanting to immerse themselves in what’s wonderful about this great sport. 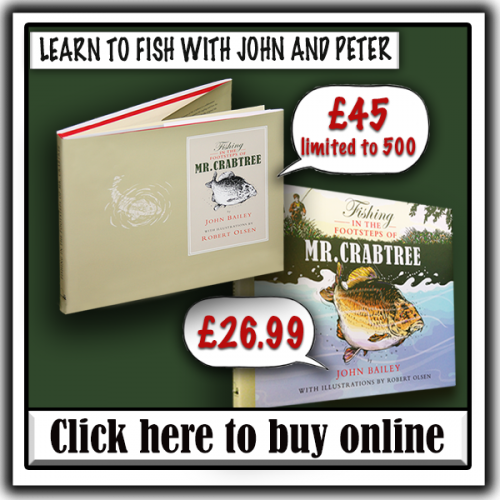 5/ I’m watching the TV series, ‘Fishing in the Footsteps of Mr. Crabtree’, is there any point buying the book as well? Very much so. There’s only so much that we can cram into the TV series. The book gives you a lot more information that it’s just not possible to put into a TV programme, and it’s something you can pick up and put down again at any time. Each comic strip in the book was storyboarded and planned out to instruct, inform and entertain – and there’s lots of them to enjoy! The book is the ideal prep for a day on the bankside – read and enjoy the night before, prepare your strategy and your target fish, and then relax and let things play out the way the fish have planned…. as they always do!